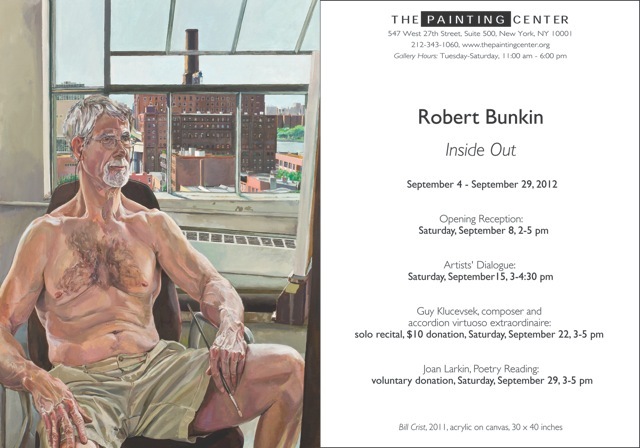 Opening Reception: Saturday, September 8, 2012, 2:00-5:00 p.m.
Main Gallery: Inside Out: Paintings by Robert Bunkin. Artists’ Dialogue: Festa and Bunkin will talk about their work, Saturday, September 15, 2012, 3:00 4:30 p.m.
Solo Recital: Guy Klucevsek, composer and accordion virtuoso extraordinaire: $10. Donation at the door, Saturday, September 22, 2012, 3:00 – 5:00 p.m. Final Day of Show and Reading by acclaimed poet Joan Larkin: donation, Saturday, September 29, 2012, 3:00 – 5:00 p.m. The Painting Center is a small, non-profit cultural organization in a large metropolitan area that helps to unite working artists and engage them in conversations about art, culture, and the challenges of painting in a rapidly changing world. The Painting Center provides a much-needed service through its singular commitment to painting. Dedicated to promoting under-served artists and promoting creative dialogue rather than commercial profit, The Painting Center provides an important stepping-stone for artists. It recognizes and celebrates the accomplishments of outstanding painters, including younger and older artists who are under-recognized.